The best place to go to find out the actual value of your junk silver coins is your local precious metal refineries. Precious metal refineries enable you to get the absolute top dollar value for your junk silver because there’s no middle man between you and the refinery. A precious metal assay specialist will carefully examine your scrap silver coins or any other unwanted pieces you bring to him. This specialist will test your pieces for metal purity and alloy content. At the end of the day you will have an option to get cash for your items or refine them into a bullion bar if you bring a substantial quantity. Two main criteria that are used to determine the melt value of scrap silver coins are their weight and purity. The higher the purity the higher the return you are going to get. 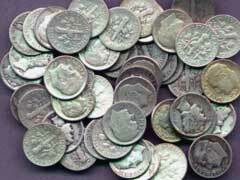 There are a number of online places that provide scrap silver coins value calculators absolutely free of charge. You can use them to preliminary establish the ball park of your scrap coin value. In case you own a few scrap silver pieces like tableware, candlesticks, bowls, these might contain additional elements that were used to maintain the structure of these pieces, in order for your refiner to calculate the exact value of these objects, all additional materials must be removed. Make sure you carefully examine all your scrap items to insure that they are truly scrap and not some rare historical coins that could be resold for a fortune. Once you get to a refiner, any design, artistic or historical value is not taken into account, it’s only the pure weight of silver you are going to get your money for, so inspect your items carefully. Should you discover any commemorative silver coins or any other numismatic coins in your grandma’s attic, do not hesitate to take these to a coin dealer to receive even more dollar value for them. On average you should expect to get at least 80-85% of the pure precious metal value calculated based on the spot price of the metal on a given day. Make sure you know these figures to help you decide whether you truly are getting the maximum possible value on your pieces.